NEW DELHI: Indian security forces put separatist leaders in Jammu and Kashmir under house arrest on Monday to thwart their march to an army camp in Srinagar to protest the killing of civilians by army personnel in Pulwama district on Saturday. The leaders of the Joint Resistance Leadership (JRL) — a group of separatist leaders — were put under house arrest when they tried to march toward the Badami Bagh army camp in Srinagar. The call for the march came after seven civilians were killed and dozens of people were injured in the Sirnoo village of the Pulwama district on Saturday when security forces opened fire at a mob that thronged the site where three terrorists and a soldier were killed on Saturday. “The killing of common Kashmiris is deeply saddening,” said JRL chairman Mirwaiz Umar Farooq in a statement after the house arrest. “We are not even allowed to express our sorrow and mourn these brutalities as our tormentors give us no space to grieve collectively and express our outrage and overwhelming emotions at these killings,” Farooq said after the house arrest. “Civilians are branded as members of the underground and terrorists which is preposterous … what is worse is that this propaganda is used as a means of endorsing and justifying the civilians killings by armed forces,” said Farooq. Srinagar and adjoining areas observed complete shutdown for the third consecutive day on Monday. Life in the southern district of Pulwama also remained paralyzed. “People are mourning but they are also very angry. If the government thinks that by killing people they can scare them, that is not happening. More and more youth are picking up guns in anger,” said a Pulwama-based journalist. “The killing of the civilians and the whole turmoil in Jammu and Kashmir are really unfortunate. We have been requesting that whenever there is an encounter between the forces and militants, the civilians should stay away. They cannot disturb the ongoing operation. 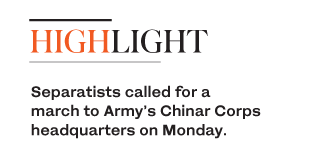 Forces and the Indian government cannot sit back and see the militancy growing,” Bhat said. The separatist leader also said that Indian government has overplayed its terrorist card, branding people as a proxy of Pakistan. “Such propaganda is aimed at electoral gains as the world sees for itself the ever-growing graph of atrocities and massacres of Kashmiris who are only asking for a just and peaceful resolution to the dispute,” Farooq said. “People are now more defiant of the security forces because they are convinced that New Delhi in its arrogance calculates that it can solve the problem through a military response rather than the recognition of the need to tolerate protest and initiate dialogue,” said the Srinagar-based academic. “It is high time that the Indian government recognize that people matter even more than mere territory. It should recognize that the dispute exists and that only civilized way to resolution is through dialogue with a people who are considerably less powerful than India’s million strong army but support a morally legitimate struggle against denied rights, liberties and life itself,” Wahid said. “Security forces are aware that villagers gather, protest during gunfights with Kashmir militants and have a responsibility to ensure civilians are not at risk,” she said in a tweet.